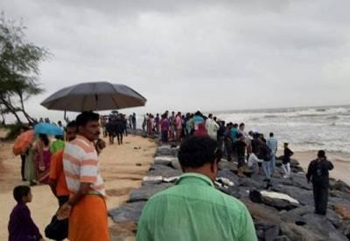 Mangaluru, June 26, 2017: Reports state that a physical education teacher from Mulki and two more persons including a young boy have gone missing after strong currents dragged a fishing boat from river mouth to the sea at the Surfing point, Sasihithlu Beach on June 25, Sunday. The missing have been identified as Yeshvant, PT Master from Mulki, Guruvappa, both aged around 40 and Guruvappa’s nephew. Yatish Baikampady, CEO, Panambur Beach Tourism Development Project, said the deceased were not fishermen. The trio had hired the boat for fishing at the Shambhavi-Nandini river mouth. The strong currents in the river mouth had pushed the boat into the sea and before they could gain control, the occupants of the boat were tossed into the sea and the boat capsized. Yatish said a panchayat member Chandra had thrown a rope to the victims, but they could not take hold of it. people of the beach saw the situation and had desperately tried to warn them. At that point of time, the boat was in shallow waters. But they could not jump and they were dragged into the sea by the currents. It was doubtful whether they could have reached the shore as the currents are really strong at this time of the year said Yatish and others. The country craft belongs to Sudhakar and keeps it in Chitrapur. A search by fishermen could not locate the bodies of the missing persons. The boat was seen from ashore for some time and later vanished from sight.